Terry’s Chocolate Orange, a yearly Christmas treat. 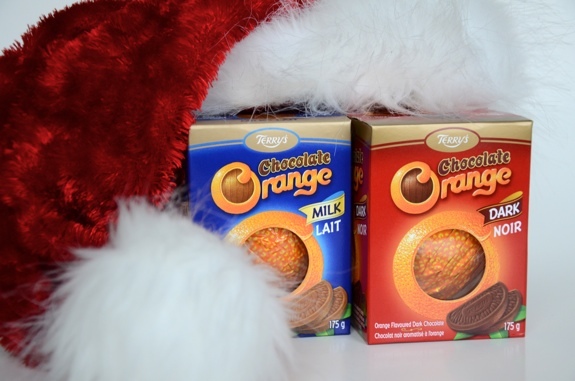 In our family, Christmas morning isn’t Christmas morning without a Terry’s Chocolate Orange in each of our stockings. I have no idea why the treat has gained a foothold in our family tradition, but I’m not complaining. 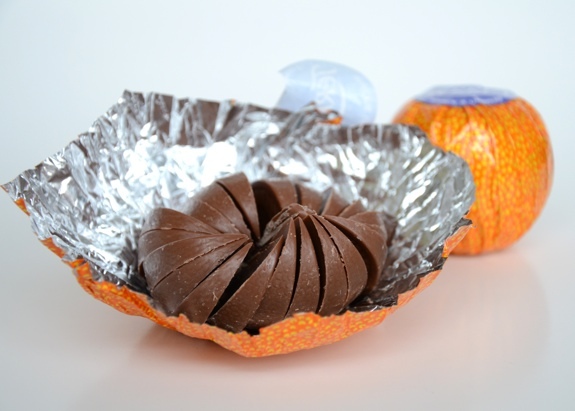 Each “orange” is a ball of orange-infused chocolate that has been formed into 20 chocolate “slices” connected together in the middle, and wrapped in a foil orange skin. In order to easily break apart and eat the slices, one must first “whack” the still-wrapped orange on a hard surface to weaken or break the slices’ connection to each other. That’s part of the fun. Milk Chocolate: I normally prefer dark chocolate to milk chocolate, but in this case, I think I like the milk chocolate variety more. It’s softer than the dark, with the richness of the dairy lending itself perfectly to the sweetness of the chocolate and the natural orange flavour. It’s sweeter from the get-go, too, dissolving into a milky, creamy texture. I’m much more likely to slowly melt the slice in my mouth instead of biting down on it, which is my instinct with the dark. The orange flavour in both is natural, leaning more toward zest than juice. It’s a whole lot like a solid, espresso-less version of a Mocha Valencia, a discontinued (at least in Canada) Starbucks beverage that combined espresso, chocolate, and orange syrup in a single mug of bliss. The chocolate itself in a Terry’s Chocolate Orange is good, but not spectacular. Just to be clear, what you’re paying for is novelty and tradition, not premium chocolate. Concrete floor. Try the basement. A kitchen counter, preferably near a support that leads down to the floor. Be gentle. A door frame. Maybe. As a last resort. A wall. These oranges are tough, and you’ll punch a hole through the drywall. Anything that can be dented. Nice dining room table? No way. The paper-thin floor in your apartment, unless you’d like a Christmas visit from your downstairs neighbours. 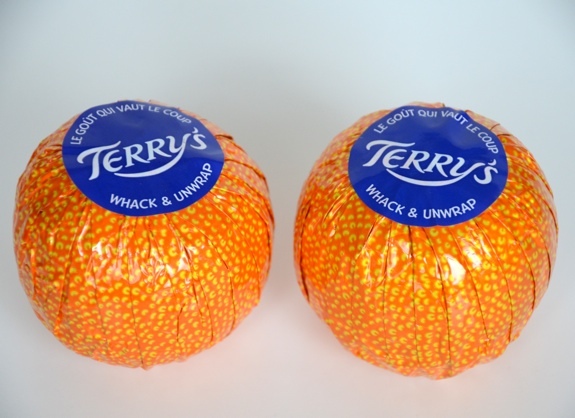 A Terry’s Chocolate Orange, unwrapped ... or is that peeled? Cost: Found mine for $5.99 at London Drugs. Saw them elsewhere from $4.99 to $7.99. Look for post-Christmas sales. Value for cash money: A large lump of orangey chocolate for $6. Not cheap, but not an everyday purchase, either. Availability: Some pharmacies, grocery stores and candy shops. Won’t be around for much longer. Nutrition? : 180 calories for FOUR SLICES??? That’s insane. You’re not going to be able to eat only four slices in a day. There are 20 slices per orange, each at 45 calories, which means 900 calories for the whole thing. The verdict: The stuff that Christmas morning sugar-overload is made of. Merry Christmas, everyone! And that's what they look like before you unwrap them. Available at Kerstin’s Chocolates just north of Jasper on 112th street – yes you pay for quality, but this Is Quality! Oh and Kerstin’s is now donating 10% of their net profits to Change For Children which helps communities & consequently children in cocoa growing regions! Or there’s the Cocoa Camino Orange bar, from the Canadian-owned La Siembra Co-op. I just bought a couple ‘C/C’ bars at the health food store in the basement of Edmonton Centre East(near Shoppers Drug Mart), but they didn’t have the Orange in. I remember getting them at Earth’s General Store on Whyte Ave. although I haven’t visited their new location-further east on Whyte. You can also check Planet Organic, they have had them in the past. However I don’t recall seeing any last time I was in the southside store. One that I Did find at Planet Organic’s southside store was the Alter Eco Dark Chocolate Twist bar with crystalized orange peel. Some temporary difficulties with the ‘site right now, but ask for it, like the other 2 I wouldn’t have mentioned it if it wasn’t Good. Thanks! Those are great recommendations! I’m totally sold on Kerstin’s, BTW. I did one of their chocolate-making classes in the summer, and I’ve been a fan of their Chocophilia bars for a couple years. In the citrus way of things, Kerstin’s Lemon Dream Chocophilia bar, combining white chocolate and candied lemon, is a personal fave. I’ll have to dig around in Earth’s General for the orange C/C bar. The new Earth’s location is great, but it’s a bit out of the way for me. The big benefit of the new shop space is that they’ve got lots more room, and they’ve used it to greatly expand their food selection. Yes the Lemon Dream bar is great, the citrus balances out the creaminess of the white chocolate(which is a bit much for some). I also liked the Domori white choc. with liquorice that she brings in from Italy – same sort of principle. I noticed that Domori also make a white choc. with mint, which I suspect would work out nicely as well. And right, a pre-New Years resolution – drop into Earth’s General Store! If not before 2011, then within the first couple months. I bought some on a whim while doing some Christmas shopping at Target this past weekend. I bought the dark chocolate variety because I prefer that to milk chocolate and I figured the antioxidants would make up for any gluttonous chocolate consumption. Anyway, so I finally had some this afternoon along with my turkey sandwich lunch from home. OMG SO GOOD. I had just two wedges and that was definitely enough to sate my chocolate cravings, but outside of the holiday season when I don’t have quite so many indulgence periods surrounding me, I could see myself eating five or six of these wedges in one sitting. How have I never had these before? I mean, I’m considerably less an Anglophile than when I was in my early twenties, so — why didn’t I go for them then? I have seriously missed out on so, so much with these wonderful treats. If I could find one place in the U.S. that sells them all year long? Mama’s going to be a happy panda for real. Also, I’m curious: I think I remember seeing something similar from Ferrara Chocolates at a Seattle Walgreens during a trip to the States last year. Have you tried the Ferrara chocolate oranges? Do they compare well with the Terry’s product?